Q. Number seven. How does it feel? RAFAEL NADAL: Well, it's really emotional, no, and unbelievable for me. I start the clay season like this is fantastic, but is fantastic winning Monte‑Carlo another time, no? Probably is a tournament that in the category of 1000 tournaments is the one that I feel more emotional when I am playing for the history of the tournament because here in 2003 everything starts. When I played qualify, I passed qualify, I won two matches. It was for the first time in my career top 100. Always is special emotions with this tournament, no? After 2005, I won seven in a row. So is something impossible to imagine for me because win seven times in a row any one is almost impossible I think. But to win Monte‑Carlo, all the best players in the world are here, you always have tough matches, is impossible to imagine for me. So I am very lucky, I think. Q. Nearly three hours and another hard game today. Physically how do you feel after those two games? RAFAEL NADAL: I feel a little bit tired, sure. During the match I was more tired than usual today. But in general was positive. That's important because these kind of matches, like yesterday, like today, improves your condition physical and mental, no? Is negative because you spent a lot of time on court, you have to run a lot on court, is always tough for the body. But if you talk about mental, you talk about until physical, that can help a lot for the rest of the clay season. Q. You were in the finals of Indian Wells and Miami. That is an awful lot of tennis to have played in a short space of time. It's hard to believe that someone can keep playing that level of tennis week in, week out. 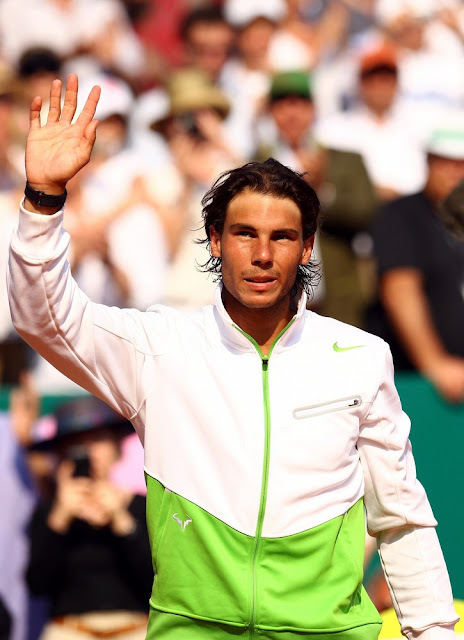 RAFAEL NADAL: Well, last month and a half I think was very positive. Is true, no, I played all the matches possible to play. I played all the finals. So that's very, very good news, fantastic news, because I played when I was health, without problems. I played every final. So that's a lot of confidence for me. Was hard lose, especially the Miami one. I was a little bit more nervous today because I know was three in a row 1000 finals, going be tough. I was a little bit nervous when I had the chance to win the second. But I was lucky little bit. One mistake with the smash 15‑All, was important point. After that probably David had a few more mistakes, one double‑fault. That helped me a lot to finish the match. I think last game, even if was tough, I think I played well last game. Even if the match was 30‑All, I only had the mistake of the smash, dropshot volley. But wasn't easy. So in general I am happy with how I closed the match today. I will try my best next week this Barcelona. Another historic tournament, important for me. I'm excited to come back there after last year. So sure is tough. But I was injured the beginning of the season. I had almost one month out of competition. I happy to come back. I happy to play and to be competitive in every match. Indian Wells to Wimbledon is the most part of the season for me, these four or five months are decisive in my season. Everything starts very well. Let's keep that with humble, motivation, and positive attitude every day. That's the only way to keep playing at this level because the important thing is I didn't play perfect this tournament and I won. I have something to improve and I am excited to try to do it. Q. UBALDO SCANAGATTA Aren't you afraid to play too much? You're thinking about Barcelona, Madrid, Rome, Paris. Is it not asking too much of your body, something that worries you? RAFAEL NADAL: I don't know. Seriously, I don't know. Q. It's you who decides the schedule. Some years ago you said you were playing maybe too much. Is there something you're going to do if you always reach the final, maybe skip one tournament? RAFAEL NADAL: That's my schedule. That's what I chosed [sic] last year or few months ago. I am happy about my calendar. If I am wrong, let's see in a few months. Is difficult to say now if I am wrong or I am asking too much of my body because the tennis is always like this. Is not the same if you play finals or you play second round or third round. But the most important thing is not the tournaments, is the matches that you are playing, no? That's true. I played three finals in a row. So I played full matches, some long matches, is true. But my calendar, you know, is difficult to say that I am playing a lot or I'm playing too much because I played one tournament to prepare Australia, Australian Open, Indian Wells, Miami, Monte‑Carlo, Barcelona. That's the only one that's obligatory. Monte‑Carlo, Barcelona, Madrid, Rome, one tournament to prepare Wimbledon. I like to play there in Queen's. I have to do it. Wimbledon. I play Cincinnati and Montréal this year. So US Open, Tokyo, Shanghai, Paris, and hopefully London. I don't know yet. Let's see. I have like maybe three, four tournaments outside the obligatory tournaments. Few ones are obligatory because you have to prepare the Grand Slam. Other ones is obligatory if you want to try to be in the top positions of the rankings. That's what I say. I'm not playing 25 tournaments. Maybe I'm playing 18 or 19 tournaments maximum. Q. There are these four or five one after another. RAFAEL NADAL: That's the calendar. That's where I have to play my best, where I have to do a lot of points. Every year I did a fantastic clay court season. I have to try to do it another time. With these four or five tournaments is where, if I am playing very well, I'm going to have the biggest chances to have enough points to try to be in the top position at the end of the year of the ranking. That's the top of my system in general. So I have to try. I am health now, so why not? Q. Can you talk about the sensations you had on the court for your game throughout the week. RAFAEL NADAL: I think I practiced very bad before the tournament. When the competition start, I started to play much better. First round was comfortable. Third round I think I played enough well. Second round wasn't an easy match against Richard. I was very happy how I played second round. Against Ljubicic was impossible to analyze nothing because was terrible windy, but keep winning in straight sets. Semifinals and final, I think the most negative thing, yeah, is for the moment I am not able to play all the time at the best of my level, no? I'm playing a few games very well. After seems like is easier to lose the concentration than usual, no? That's the only, in my opinion, negative thing. I hope this victory help me a lot for the confidence. Maybe I am a little bit more nervous than usual. I'm playing a little bit more defensive than what I have to do. So hopefully this victory is a lot of confidence for me after playing two finals in a row. So the positive results are coming. Hopefully I'm going to play much more aggressive. I gonna try. Q. You say you're more nervous. Is that because of the three finals you lost? RAFAEL NADAL: Every season is completely different. When you start the season, you don't know where you gonna be. I started the season ‑ I said a hundred times, no ‑ I felt fantastic, well, before I started the season. I was a little bit unlucky at the beginning of the season. After that, you start, have tough matches. Indian Wells was very positive result for me, important for the confidence, even though I didn't play well be in the final. Miami I think I started to play much better. Here I did well. I didn't play very, very well, but I did well I think moments better than others. The two loses of the finals, especially the Miami one, affects a little bit. You are more nervous than usual, for sure. Q. You said last year you played maybe your best tennis on clay here. RAFAEL NADAL: I think so. Q. This week was not the same. For the confidence, what is the difference between playing so well or winning without playing so well? RAFAEL NADAL: Always you have to think about positive. You are playing too well, is fantastic because you are playing unbelievable. Let's keep doing like this. If you are winning without playing your best, seems like you have enough tennis to keep being competitive even if you're not playing perfect. So let's try to play better. If you play better, you have even more chances. So that's the positive way of both things, no? I said I didn't play bad. I played okay, I think. But I think I can improve a few things for next weeks. I think this victory gonna give me lot of confidence. You know, I am sliding less than usual on clay. Is easier to defend well when you are sliding, especially to the forehand. I am not doing well the service. But two more days to practice for Barcelona. Let's see. Q. Is more difficult to win a tournament seven times in a row or a Grand Slam tournament? RAFAEL NADAL: That's a joke. Is no answer for this. Is much more difficult win seven times in a row than win Grand Slam. Win a Grand Slam is two weeks, one tournament. If you are playing well that two weeks, almost everybody can win. Seven times in a row one tournament, a lot of factors have to be there. You have to be health, you have to be health every year there, you have to play well every year there. Is not a small tournament; is a big tournament. You have to win difficult matches. You have to pass over difficult situations. Seven years are a lot, a lot of matches that you really can lose. Q. You keep saying that what you're doing is almost impossible every time you win a tournament. It's impossible to win the French and Wimbledon back to back. You do it. You're almost making the impossible possible. RAFAEL NADAL: But when I say that, I am not saying nothing that I don't think. That's what I feel. When I am practicing in Mallorca, three days before I start the clay season, I always think I gonna be ready to play well another time and to win another time. I hope yes. But at the end of the day the true is you never know when this start and you never know when this end. You have to be ready for everything for accept both things. Is easier to accept everything if you think that is impossible what you did last year. Is another thing I said: When everybody talks about, You are the favorite, at the end of the day is play every match. When you go on court every day, you can win, you can lose. That's what I think. I am not saying nothing strange, I think. Even if I won a lot on clay the last few years, is true, but I can lose. Q. You're proving yourself wrong almost. RAFAEL NADAL: No, I think the tennis is A very competitive game. Even if sometimes, you know, you win 6‑3, 6‑3, or 6‑3, 6‑4, these few points during the match for sure can change the situation and the score of the match. If you are not ready to win these three or four points, you gonna be in big trouble almost in every match. That's what I think. I don't know if I gonna be ready to keep winning these three or four important points in the match for how many years or how much time. Q. UBALDO SCANAGATTA Another question difficult for you to answer. Do you see yourself still playing for how long? I don't know if you know it. When you think about yourself, do you think, When I am 29, I'll still be playing like Federer trying to win, or you think maybe it's too long? RAFAEL NADAL: I gonna stop playing tennis when I gonna lose my illusion to keep improving and when I lose my illusion to keep going on court, keep fighting. I don't know when gonna happen that. So I don't know gonna happen next month or gonna happen in five years, two years, eight years. That's the answer. I don't know. Always talking about the health, no injuries, because you have to stop for an injury, like happen to Carlos Moya. He really want to keep playing, but he is not health enough to keep playing. If I am health, that is the answer. When I lose my illusion to keep improving, the illusion to try to enjoy the tour, that's the most important thing: be happy and appreciate the things.